Trenton, New Jersey’s largest firefighter union will be building memorial playgrounds to honor each of the 26 Newtown victims. 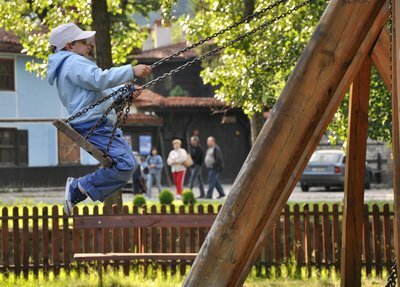 The playgrounds will be located in New Jersey, New York and Connecticut towns that were devastated by Superstorm Sandy. Each of the playgrounds will be designed to represent the personality of the child or teacher for whom they are named. One of the playgrounds will be built to honor 6 year old Catherine Hubbard. Catherine’s mom, Jenny Hubbard said the idea for the playgrounds just felt right from the moment she heard it. "I immediately could think of Catherine playing and swinging," she said Friday in a telephone interview. "I know that Catherine will be there and she will love that there are kids to play with on that playground. In a way, this is like us giving her back her swing set," ABC reports. She was mad that she had to leave her beloved swing and playground behind when the family moved across Newtown two months before the Sandy Hook shooting. Catherine’s playground will have a tire swing and be built near a beach on Staten Island, as she loved sea animals. Her 8 year old brother Fred has been named honorary project foreman and is expected to be on-site while the playground is built by first responders and members of the community. Bill has reached out to all 26 families and has gotten positive feedback from 16 of the families as of now. The entire project will cost 2.1 million, and they have received enough donations to fund six playgrounds already. A website has been setup to accept donations at www.thesandygroundproject.org. The project is named, “The Sandy Ground: Where Angels Play”, and was conceived as a way to honor the victims of the Newtown tragedy, but he hopes the idea will catch on and be a way to honor children victims of tragic violence all over the country. The first playground, to honor special education teacher Ann Marie Murphy, is expected to break ground in Sea Bright, N.J. on March 1st. It may include a dog run because of her love for her pet and will feature a climbing wall and slides picked by children in the town. Sea Bright’s Mayor Dina Long said the project will have a positive impact on the community that was devastated by Sandy. Sea Bright, N.J. lost their entire business district in the storm. "The residents of Sea Bright lost so much from Superstorm Sandy that something like a new playground, besides providing a safe place for our children to play, is also a symbol of hope and recovery," she said. "It has a far greater impact than just a nice playground." Long Island Landscape: Late Bloom or Damage from Superstorm Sandy? Subject: LongIsland.com - Your Name sent you Article details of "Memorial Playgrounds to Honor Newtown Victims in Sandy Devastated areas"